After a lovely homemade breakfast at Eric and Jubilee's house, we drove an hour out into the San Joaquin Valley to get to our storage shed in Tracy. As it turned out, getting the shed open was the hard part. Only months after we'd stowed our stuff there prior to heading down to Central America, we got a phone call from the management saying our shed had been broken into. Sure enough, the few electronic items we'd stored were stolen. Worse than that, the managment responded by putting 2 new locks on the door, neither of which we could find the key to! The end result of all this was that the new manager had to cut the locks off with a special tool and it took almost an hour to get them off. Fortunately, once the locks were off, we were able to load everything from the shed to the trailer in only about 20 minutes. Anxious now to be home again, we took the most direct route from the Bay Area back to Tupelo. This mostly consisted of the I-40 corridor from Barstow to Memphis, places where we don't really know anybody. 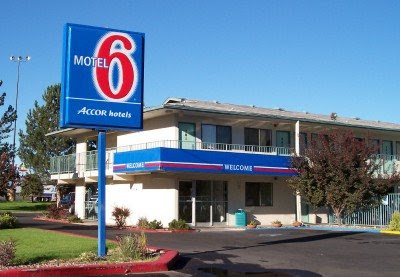 After spending the first 16 nights of the trip in "guest rooms" or the tent, we spent the final 4 nights in Motel 6's, where we enjoyed swimming pools and wireless Internet, but occasionally had to hide out in the bathroom or under the covers until Rowan fell asleep! We stopped in northeast Arizona for a brief scenic detour through Petrified Forest National park. These petrified logs are more like giant crystals now, after spending hundreds of millions of years under an ancient ocean. The trees died some 225 million years ago. It really boggles the mind to think about such a long time! Getting caught taking even the smallest sliver of petrified wood brings a fine of $325, so we had to keep an eye on our little rock-hound to make sure he didn't stuff any in his pockets! We figure Rowan will really love this place if we bring him back in about 7 or 8 years. For now he was more than content being in charge of Kina's leash! The high desert landscapes are almost otherworldly in this region. 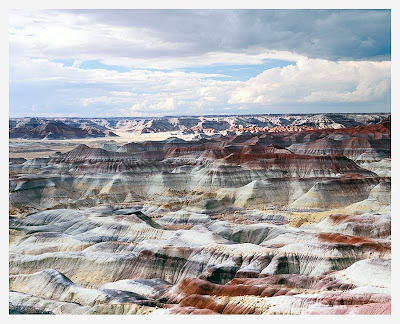 ...the badlands of the Painted Desert. Actually this was as close as we got to the really dramatic landscapes; the previous photo is from the Painted Desert page on Wikipedia, since Rowan had just fallen asleep in the carseat and we didn't want to wake him up to go exploring. Besides, we had too much driving to do to dally around, so soon enough we were back on I-40 heading east. In the western highlands of Gallup, New Mexico, the downtown buildings are adorned with modern murals celebrating Native American culture. Here in Gallup we enjoyed an excellent lunch before heading east toward Texas and Oklahoma. Also in Groom were this blown-out roadsign and leaning water tower, giving the appearance of a sort of modern-day ghost town. At least it broke up the endless monotony of flat, wide-open pasture plains. At this point of the trip, we pretty much stopped taking photos, except for at one of the Arkansas rest areas we stopped at on our final day of driving. At 6pm on Friday, July 18, we pulled into our driveway in Tupelo - 21 days after we'd left the morning of June 28. After over 5000 miles of highway (around $1600 in gas!) and a treasure trove of travel memories, we began the arduous process of unloading and unpacking the 30+ boxes of our long-lost stuff.